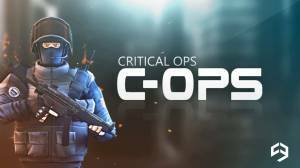 Critical Ops was obviously inspired by the Counter Strike series and like its console counterpart is a fast paced free-to-play first-person shooter (FPS) that will test your reflexes and tactical skills as you experience modern terrorist warfare. In Critical Ops you either play the role of a terrorist who battles to perpetrate an act of terror or as a counter-terrorist who tries to prevent the act of terrorism taking place. Team Deathmatch and Defuse the are the two modes in Critical Ops and each can be played on any of the handful of maps. • Two game modes. • Customise your favourite weapon. Team Deathmatch and Defuse the are the two modes in Critical Ops and each can be played on any of the handful of maps. What is the Best way to Learn the Basics? How much does Weapons & Gear Cost? What Weapon should I Select? How do you get a Better Loadout? Is it a Cross-Platform Game? No discussions open for Critical Ops at the moment.